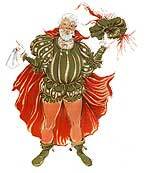 Long before Gregory Maguire wrote the novel upon which Stephen Schwartz (music and lyrics) and Winnie Holzman (book) based their wildly successful musical, L. Frank Baum's original "children's story" had already been misinterpreted and watered down by the famous movie version. Baum wrote The Wizard of Oz as a monetary allegory to deal with the banks' attempt to hijack the United States through control over money creation, the manipulation of gold (yellow brick road and the golden cap), and the suppression of silver (Dorothy's slippers in the book). 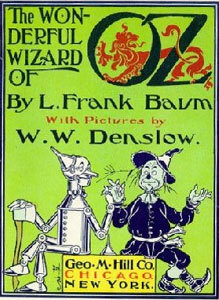 The journey of Dorothy's friends—the Tin Woodman (industrial workers), the Scarecrow (farmers), and the Cowardly Lion (William Jennings Bryan)—to Oz mirrored Coxey's Army's (the unemployed) 1894 march on Washington, while the Wicked Witch of the West (John D. Rockefeller) and the Wicked Witch of the East (J.P. Morgan) were, literally, the figureheads of battling banking families, who terrorized the populace through their lackeys, the flying monkeys. In a way, this compelling prequel looks at some of the subtler aspects of the Emerald City (Washington, D.C., home of the Federal Reserve—the magic printing press—owned by the world's central bankers, who have leveraged their private bank notes [Federal Reserve Notes] and the Bretton Woods agreement after World War II, when Federal Reserve Notes were made the world's reserve currency, into ownership over the world's largest commercial and investment banks, transnational corporations, governments, media, and voting processes). 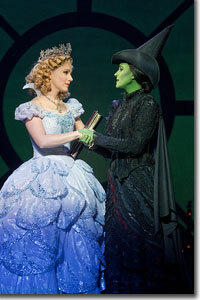 Wicked revolves around two of the original witches from The Wizard of Oz: Elphaba (from L. Frank Baum), played by Mamie Parris, a green-skinned outcast who becomes the Wicked Witch of the West, and Galinda (Alli Mauzey), later Glinda, the lovely, popular, and controlling blonde, who becomes the Good Witch of the North. Maguire's tale, of how the girls—who meet at an exclusive school for magicians—became the famous witches, brings into focus the politics behind the propaganda, that is, the reasons behind the demonizing of Elphaba by the Wizard (Mark Jacoby) and his upper-echelon collaborators. Elphaba is not only discriminated against because of the color of her skin, she is targeted because she threatens to pull back the curtain on the nefarious doings of the power elite—their counterfeit value system and rule through fear. Mind you, this epic storyline is, for the most part, subtext in the musical, which represents these forces in the broadest strokes possible, with Elphaba coming to the defense of the animals that are losing their rights, including their (free) speech, and are being caged. Meanwhile, Glinda, through her friendship with Elphaba, sheds her spoiled ways and develops the moral sense that we see exercised in The Wizard of Oz, basically, helping Dorothy clean up Oz. 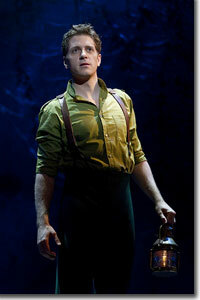 The girls' relationship is complicated by their mutual attraction to Fiyero (Andy Kelso), who arrives at the school as a spoiled rich boy and rebel, caught between his privileged background, like Glinda, and his sense of right, like Elphaba. Mauzey's knack for comedy and Parris' fearless passion, along with a strong score and polished musical numbers pack a lot of punch. All this is topped off with dynamite effects, a splashy scenic and lighting display, and a number of unexpected twists and turns. The sub-plots amplify the complexities of the main theme: the conflicting motivations that lead many well-intentioned people to abandon their values and succomb to the forces of oppression and greed. 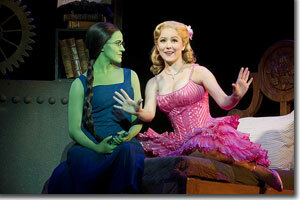 Denver Center Attractions presentation of Wicked runs through May 20th. For tickets: 303-893-4100 or www.denvercenter.org.